The Aquabats Supershow – Super Wacky! | TWINSANITY! The Aquabats Supershow – Super Wacky! Most fans of the Hasbro owned cable/satellite channel known as The Hub know the channel as “That Transformers/G.I. Joe” Channel” or “The channel that My Little Pony Built”. Some others know The Hub as the channel that airs Dan Vs. However, there is one show that currently airs on The Hub which doesn’t get as much press as those shows aforementioned, and one that I feel is deserving of more praise than it receives. That series is a live action campy hoot known as The Aquabats Supershow! The Aquabats is an American rock band that was formed in Orange County, California in 1994. The band was founded by Jacobs, Chad Larson and Boyd Terry. The 3 friends got the idea to form a joke band that satirized the Orange County punk scene. The idea was to start an unabashedly silly band boasting a happy, positive persona — an antithesis to aggressive and humorless punk bands — with the intention of performing at punk shows to poke fun at the scene. Easily identified by their Lone Ranger masks, Positivity Helmets and matching costumes, The Aquabats are perhaps most recognized for their theatrical persona in which they claim to be crime-fighting superheroes. This theme serves as subject for much of the band’s music and as part of their stage shows, which regularly feature comedic stunts and fight scenes with costumed villains and creatures. The band has gone through several fluctuations and also several members with Jacobs and Larson being the only constants. Since their debut in 1996, The Aquabats have released five studio albums, two extended plays and one compilation, among other recordings. The TV series began as a 5 minute pilot called The Aquabats in Color! which was originally pitched to The Fox Family Channel in 1994, but the project was canceled. Each 22 minute episode of The Aquabats Super Show! is done in a style similar to The Looney Tunes Show, consisting of 1 half-hour story featuring the live action Aquabats doing comedic battle with some formidable, but ridiculous nemesis, intermixed with a funny cartoon blackout starring Li’l Bat, the Aquabats’ mascot, an animated segment (creatively titled “A CARTOON”) via a random miniature TV set that appears in some incongruous location featuring animated versions of The Aquabats (ironically, the cartoon segments follow a continuing story format, while the live action are always a self contained story), and a commercial parody. The latter of which are a staple of the Aquabats’ stage shows. The MC Bat Commander (played by the band’s lead singer, Christian Jacobs, distinguishable by his Zorro-like mustache and his missing front tooth): He’s the leader of The Aquabats and a self-described “Man of Action”. He’s got the swagger. He’s got the bravado, but interestingly, he’s the only member of the team without a super power. Crash McLarson (played by bassist Chad Larson, distinguishable by his being the tallest Aquabat and his bushy eyebrows): Basically a big birdbrained lug who has the ability to grow to 50 feet in size. Unfortunately, he hasn’t yet mastered this ability and so he usually only gets this power to work when he’s extremely mad and/or upset (“GETTING EMOTIONAL!!”). Interestingly, Crash’s animated self seems to be in complete control of his size altering ability. Ricky Fitness (played by drummer Richard Falomir, distinguishable by his trim physique and the braces on his teeth): A reformed juvenile delinquent who’s now all about clean living and fitness. He has the power of super speed. He’s also the band’s “ladies’ man” of sorts, falling for nearly ever attractive young woman he sees. Eagle “Bones” Falconhawk: (played by guitarist Ian Fowles, distinguishable by his long brown hair): The band’s iconiclast and strident individualist who’s full of personal pride to the point of cockiness at times. He possesses a magic guitar which he can fire lasers from. He was also granted a mystical “second sight” from a floating shaman head, giving him the ability to see fairies and other apparitions, as well as the ability to summon an invisible spirit animal, a female eagle known as “The Dude”. But since no one else can see her, his teammates just think that he’s bonkers. Jimmy the Robot (played by keyboardist James R. Biggs Jr., distinguishable by his metal chin plate and his metal hands): Jimmy is an android who was created by The Aquabats (most likely) and is easily the smartest member of the team. He has a computer brain and the ability to fire purple lasers from his fingertips. He’s also the team’s science and technology expert. Ironically, despite his being artificial, seems to possess the most human vulnerability of the team, emotion-wise. This series mostly reminds me of the old Batman live action series which ran from 1966 to 1968 starring Adam West and Burt Ward, which I didn’t see when it originally aired because I didn’t exist back then (I watched the show 2nd hand in syndication). It’s pure camp and goofiness. Much of what happens on the show is unexplained and is just plain silly, but it works. It’s like a living cartoon. In fact, The Aquabats Supershow is what Warner Brothers’ feeble attempt at a Looney Tunes cape show Loonatics Unleashed should have been; a silly superhero spoof which doesn’t take itself seriously at all. Any series that can boast not 1, but 2 guest appearances by “Weird Al” Yankovic (one as the U.S. President and the other as a Superman/Shazam knock-off named”Super Magic Power Man”) is OK in my book. Christian Jacobs has apparently wanted to make a series like this for some time now, so I guess that he’s basically living the dream. It’s also worth mentioning that The Hub has ordered a 2nd season of The Aquabats Super Show, which is slated to run this Spring. All I can say is “More power to you!”, guys. ← Why Y’all Hatin’ on Witch Lezah? The Aquabats have launched a Kickstarter to revive the show. Yeah, I’ve been following that on The Aquabats’ YouTube channel. I hope that they reach their goal. 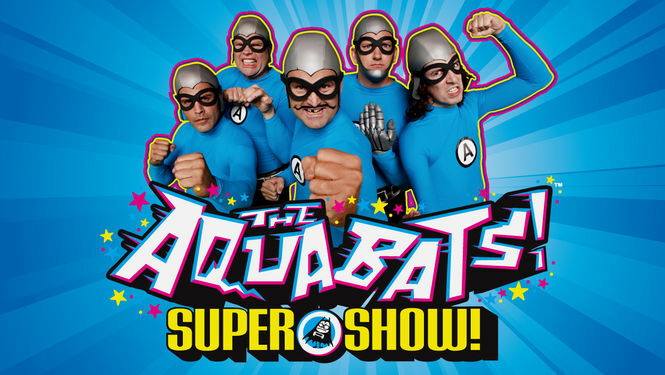 I’m curious to see where The Aquabats Super Show! will air if they’re able to produce more episodes. I very much doubt that it would air on Discovery Family, since The Hub is dead and Discovery is too cheap to finance any original programming for Disc Fam. Most likely, it’ll be on some internet service like Hulu or Netflix or something similar. There’s about a week left in the campaign and the Kickstarter still has yet to generate over half the intended amount of money. The Aquabats are restarting the campaign next week with a smaller goal. Well, if they can’t raise enough money to finance another season of the show, perhaps they can at least make a special. I’ll take what I can get.